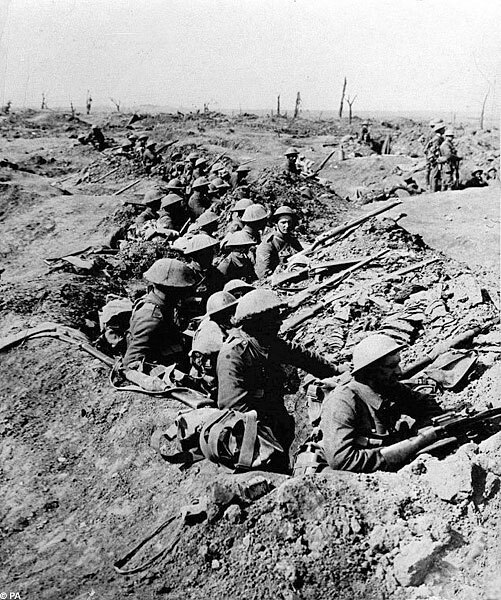 "Lions led by donkeys," as the British army were slaughtered like cattle is how people started portraying World War I in the months following the slaughter of over a million British soldiers, 20,000 in one day alone, July 1, 1916, the Battle of the Somme. On Saturday, hundreds of English, French, Germans, Canadians, and people from other nations memorialized the massive deaths in the battle that triggered and reinforced anti-war movements in both Britain and Germany. The British Generals botched the situation badly, so badly that by the 1920s, many veterans were describing the entire war a "Lions led by Donkeys." By 1916, the War had been going on for two years, and the British politicians were demanding a quick victory to end the war against the Germans. But they made obvious preparations for the battle the entire week before, thus telegraphing their intentions to the Germans. The Germans were prepared for their overconfident assault, and slaughtered them. Ironically, Owen died in 1918 in the same week that WW I ended. The war was botched on the German side as well. They were pulled into the war unwillingly, because of a defense treaty with Austria. Then they hoped to overrun France quickly, as they'd done in the 1869 in the Franco-Prussian war, and in August 1914, Germany planned a quick, total victory over France, requiring only six weeks -- too quick for the British troops to be deployed to stop the advance into France. The plan went fantastically well for about two weeks -- but then the Germans sent two corps of soldiers to the eastern front to fight the Russians. Without those soldiers, Germany's rapid sweep was halted by the French long enough to give the British troops time to reinforce the French. Both the German and French sides dug themselves into static trenches. There was even a famous "Christmas truce." During the Christmas season of 1914, the German high command shipped thousands of Christmas trees to the front lines, cutting into its ammunition shipments. This led to a widely publicized Christmas truce between the British and German troops, where soldiers and officers on both sides all got together and sang Christmas carols. By 1918, the German people were sick of the war, and when the Americans joined the war, that was the last straw for the German people, who forced their country's leaders to capitulate. After the war, the young German soldier Erich Maria Remarque wrote Im Westen Nichts Neues (All Quiet on the Western Front), depicting the heroic soldiers as becoming a "lost generation," following a completely pointless war. Today there are few people, even among historians (as I've discovered), who have any idea what the Great War (WW I) was about. Most people seem to believe that WW I was the same as WW II -- some pre-Hitler Hitler-type decided to invade France and started a world war. But the botched prosecution of WW I in Western Europe is one of the signs that it was quite different from WW II. It was principally an East European war, leading to genocide in the Balkans, the Bolshevik Revolution, and the destruction of the Ottoman (Muslim) Empire. In Western Europe, World War I was a non-crisis war (in the sense defined by Generational Dynamics), for both England and Germany -- and for America as well. That's why it's wrong to compare World War I to World War II for America or Western Europe. The correct comparison is World War I and the Vietnam War, both non-crisis wars for America. In both cases there was huge political opposition to the war, and although the soldiers fought bravely, the prosecution of the war was sloppy and faulty. Political opinion that the Iraq war is ALSO being botched, like World War I, and is also being fought by lions led by donkeys (the main donkey being President Bush). This comparison of the Iraq war to WW I makes as little sense as comparing it to the Vietnam War. I discussed this at length in "Why aren't college students protesting against the Iraq war?" Wilfred Owen and Erich Maria Remarque were young men, both soldiers who fought in the war. Today's anti-war protesters are old folks like John Kerry and Cindy Sheehan -- the same old folks who, as young folks 30-40 years ago, had protested against the Vietnam war. Today's young folks are not anti-war protesters. They care about their parents and their country. 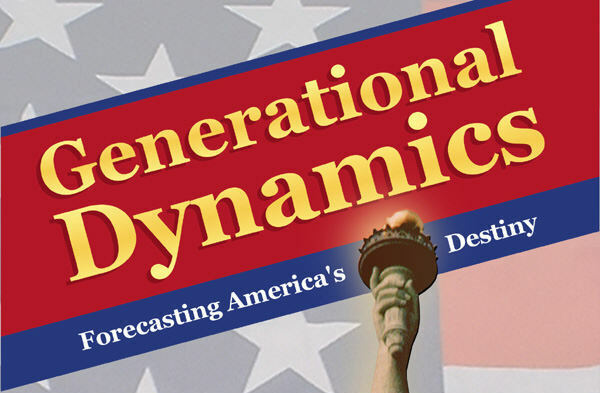 They will be the next "Greatest Generation." "What passing-bells for these who die as cattle?" was the line by Wilfred Owen that we quoted above. Why did so many people die in both World War I and World War II? For centuries prior to the 1900s, the death rate for major wars was something like 80 per 100,000 population. But in World War I, the death rate suddenly jumped to 300 per 100,000 population, and in World War II it was 700 per 100,000. In other words, after centuries of fairly constant death rates, the death rate jumped by a factor of almost 10 in the 1900s. Why did that happen? Why did so many more people die in the 1900s than in earlier centuries? "For the first time in our history, we put mere boys into an assault against the bomb, bullets and the terrible wire entanglements, equipped with little more than raw courage," the prince said. "It is impossible not to be overwhelmed by a mix of deep emotion, humiliation and awe, sadness and pride." But there had been new technologies in earlier centuries as well, with no great effect on the number of war dead. The "bomb, bullets and terrible wire entanglements" might have had some increase in war dead, but doesn't explain a factor of four or five. It turns out that a more relevant question is this: Where did all those soldiers come from? The stories of the Battle of the Somme are horrifying -- fields packed with dead bodies, soldiers forced to walk over those dead bodies for the next assault on the enemy. Well, where did all those soldiers come from, all of a sudden? The answer is dramatic. It took me a long time to connect the dots on this issue, but the short answer is provided by looking at the adjacent graph. But infant and child mortality fell dramatically in the 1890s, and again in the 1920s, as you can see from the graph. This fall in infant mortality meant that a lot more infants lived long enough to become soldiers. That's why there were so many more soldiers in WW I, and then again in WW II. And that's why there were so many more soldiers to be killed. I've mentioned many times in this web log that the median age in the Gaza Strip is 15.6. Gaza is also one of the most densely populated regions in the world. And although Gaza is not the subject of this particular essay, it's worth pointing out that the latest conflict with Israel has left many parts of Gaza as a large prison with no electricity or running water, and little money. Gasoline and food are running out. No matter how justified the Israeli missile strikes are, they're leaving behind this large, crowded, young population of virile and increasingly angry young men with increasingly deprived angry young girlfriends and wives. The situation in the Mideast gets measurably worse each and every day, and these young men will soon lead the Palestinians into a war against Israel, and this war will end up engulfing the region. The population situation in Gaza might have come about anyway, but it was certainly helped by the advances in medicine that have reduced the level of infant mortality still further since 1950. And Gaza is not unique. There are highly densely populated regions around the world, as women give birth to more and more babies, and these babies survive into young adulthood, where they might have died in infancy in the past. There's no longer enough farmland for these huge masses of people, and so more and more people are crowding into densely populated rural areas. This year, for the first time in history, there are more people on earth living in cities than in rural areas. This has been made possible by the rise of huge, densely packed "mega-cities" around the world. According to the book Planet of Slums, by Miles Davis, in 1950 there were 86 cities in the world with a population of more than one million; today there are 400. Large cities breed (in both senses) even larger cities. Today, there are six cities -- Mexico City, Seoul-Injon, New York, São Paulo, Mumbai (Bombay), and Delhi -- with populations around 20 million. These are not cities of people living in glamorous apartments; they're often people living in slums. If you live in a home with a back yard, you can at least grow some crops of your own to survive if necessary. But in a crowded city, that's impossible, and an economic recession that hits the entire region can cause the starvation of tens or hundreds of thousands of people. "In the Philippines, millions of Filipinos work for Chinese; almost no Chinese work for Filipinos. The Chinese dominate industry and commerce at every level of society. Global markets intensify this dominance: When foreign investors do business in the Philippines, they deal almost exclusively with Chinese. Apart from a handful of corrupt politicians and a few aristocratic Spanish mestizo families, all of the Philippines' billionaires are of Chinese descent. By contrast, all menial jobs in the Philippines are filled by Filipinos. All peasants are Filipinos. All domestic servants and squatters are Filipinos. in Manila, thousands of ethnic Filipinos used to live on or around the Payatas garbage dump: a twelve-block-wide mountain of fermenting refuse known as the Promised Land. By scavenging through rotting food and dead animal carcasses, the squatters were able to eke out a living. In July 2000, as a result of accumulating methane gas, the garbage mountain imploded and collapsed, killing something over a hundred people, including many young children." This is not a rare situation, but a situation that's occurring around the world. And it's a situation that's come about for a number of reasons, but one of the major reasons is a reduction in infant and child mortality. The last 20 years have been a time of exceptional worldwide prosperity, especially during the last ten years, thanks to the various bubbles -- the stock market bubble, the real estate bubble, the credit bubble, and so forth. But if there's a worldwide recession -- and there must be sooner or later, and probably sooner -- then poverty levels around the world will increase quickly, and suddenly tens or hundreds of millions of men will no longer be able to feed themselves or their families. And when a young man can no longer afford to feed himself or his family, then he has little reason not to go to war. These young men will go to war against those whom they perceive to be wealthy oppressors -- whether it's the Palestinians against Israel, Mexican immigrants against American Anglos, North Koreans against South Koreans, or Chinese peasants against wealthy, corrupt government officials. The United Nations has many conflicting goals, and two of the most prominent are: Reduce poverty and starvation around the world; and reduce infant mortality around the world. Unfortunately, reducing infant mortality increases the population so much that there's not enough food to feed them, and so the reduction of poverty and starvation become an unrealistic goal. It would be nice if it were possible for human beings to create a "paradise on earth," where everyone was healthy and everyone was well fed. But that's impossible, because you always run out of food, and then there has to be war. We're approaching the Clash of Civilizations world war, at a time when infant mortality has fallen far, leading to masses of people, packed by the millions into large megacities, in a fragile world where any economic dislocation can cause mass starvation, creating huge pools of young men ready for war. So the Battle of the Somme, and the slaughter of masses of "these who die as cattle" still has a lot to teach us today.